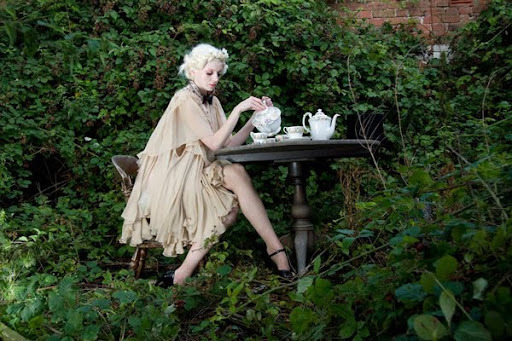 Alice in Wonderland inspired photography from here. I can't wait to see the movie, I started a count down a week ago! I know! I'm so excited too. Its going to be such an experience. Gorgeous photos! I've started penciling in all my girls for an Alice in Wonderland movie date. Excited! I'm so excited! Going to have to wait an extra week though as am going away at the weekend! Holy moly MOLY holy moly. I am so so so excited. It's just going to be delightful!! hey sweetie, your header makes me smile:) there's something about it. I can't wait to see it, especially if I can go see the 3D version! I love those pictures! But I;m not looking forward to the film. I hate Tim Burton with a passion! That book was pretty trippy anyway, even the Disney version scared the crapola out of me. Tim Burton is pretty freaky on any normal subject, let alone a book written in a haze of opium! But I hope you all enjoy it! I think I will love that movie! Anyway, the model doesn't impress me, but the first skirt does!! 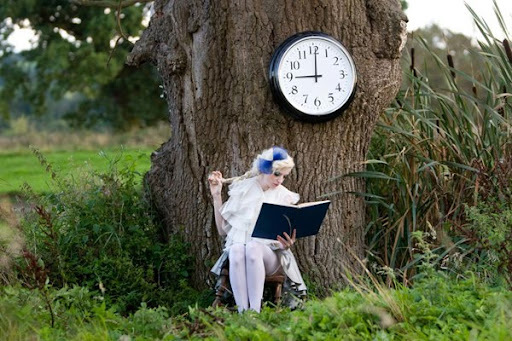 i never stop being inspired by alice & her wonderland! so lovely! The last photo is my favorite. I love how the clock is affixed to the tree. I know I'm one of the few, but I'm not that psyched about the movie. I guess I've just never been a big fan of Alice's story, but I always love Burton's movies. So I'm sure I'll still go. these pics are amazing love them! Love these Pictures! Thanks for sharing!